James Garrett is a brain science curator, neuroscience entrepreneur, and founder of Brain by Design. He passionately believes anyone can become who they imagine themselves to be at their very best. James spent his 20s doing psychology research at Columbia, Tufts, and Yale, and his 30s building Think Unlimited, a nonprofit organization that created brain-based curricula in partnership with the Queen of Jordan. Through his platform Brain by Design, he now builds e-learning courses about how to maximize your brain's potential. A rare combination of scientist, trainer, and entrepreneur, his previous work in the Middle East was featured by: NYTimes, FastCompany, and TEDx. Text the word Brain to 44144 to receive a free pdf from James! *James’ special offer expires Sunday, Dec. 2nd at midnight PST. TEASER CLIP: James: Your brain never turns off. It’s like a light switch, but it doesn’t turn on and off. It actually turns side to side, so think of it as a light switch sideways. It flips from executive mode to creative mode when you do these types of activities. As it’s in this more creative, deep, problem-solving mode, it’s just solving the problem in a totally different way. So you’re basically accessing your deepest recesses of creativity and sort of flexible problem solving when you’re doing that. On the surface of it, when I’m laying on the grass, if I were a manager of me, I would look at that person on the grass and be like, “Wow, they’re not at their desk, working.” And we punish these things, right? But it’s very clear, every peak performer in the world just does this. The stories are endless. Jeff Weiner, the CEO of LinkedIn, built his day this way. He works for 90 minute blocks, 90 minutes to two hours, and then he takes a break for 30 minutes. Halelly: Hey, hey, TalentGrowers. Welcome back to another episode of the TalentGrow Show. I’m Halelly Azulay, your leadership development strategist here at TalentGrow and this week we’re going to talk about how to help yourself get better results from your brain. Especially when you think about when we need to be creative, innovative, to solve problems, a lot of times we try to do it in a way that doesn’t allow our brain to thrive. 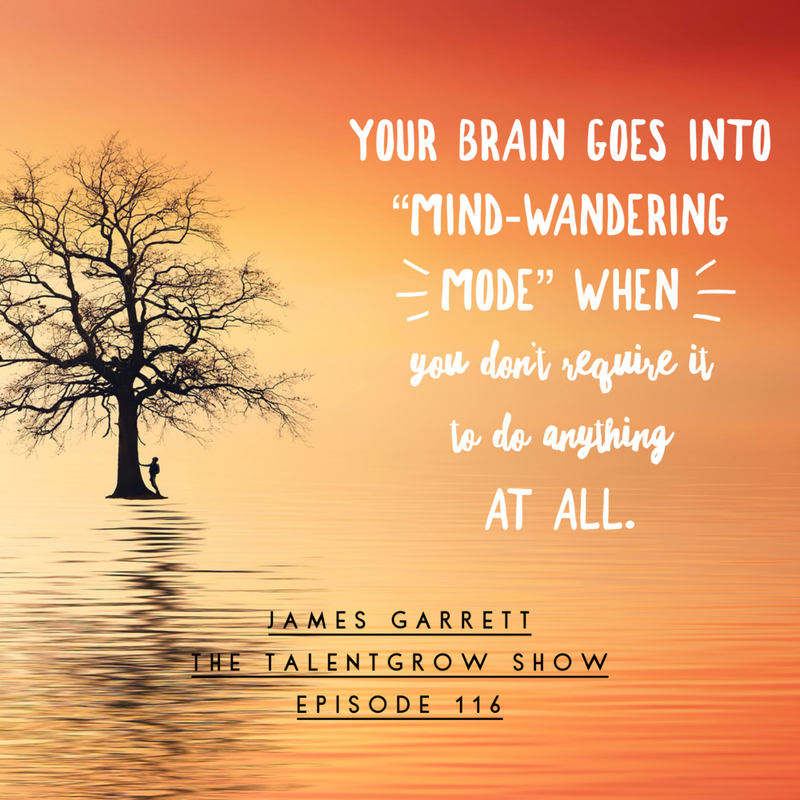 This week, our guest is James Garrett, who is a brain science curator and he’s going to talk to us about some of the research out there in neuroscience and brain science and how we can harness that to get better performance from our brain and better results at work. He’s going to talk to us about how to switch between the executive mode and the creative mode of our brain, ways that we can leverage taking breaks and even potentially taking naps so that we can actually become more productive. I hope that you enjoy a lot of actionable advice and tips in this episode and an interesting story about the Queen of Jordan. Without further ado, here we go. James Garrett on the TalentGrow Show. 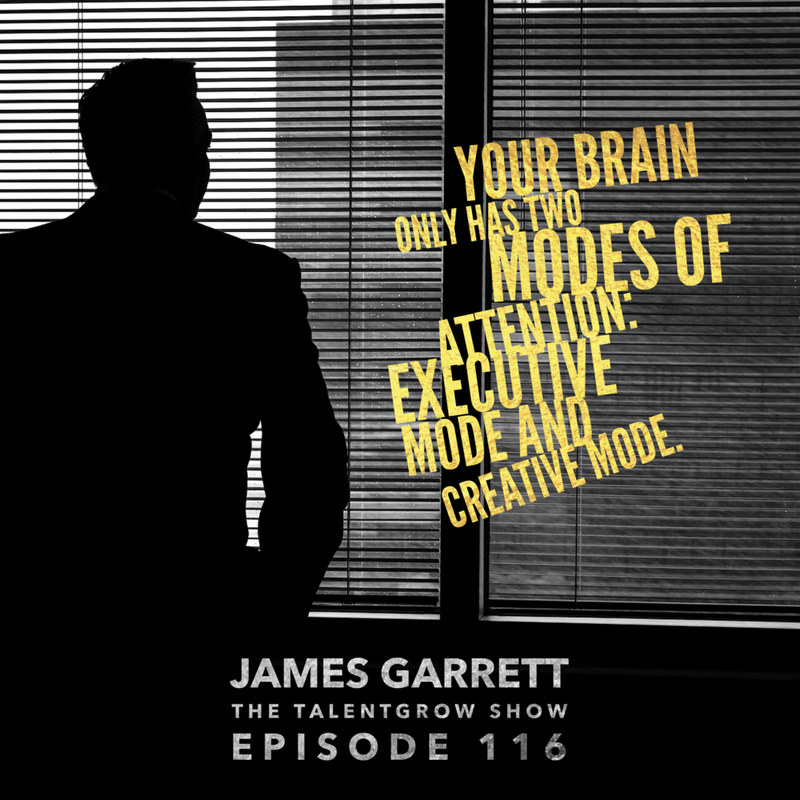 TalentGrowers, this week I have James Garrett. He’s a brain science curator, neuroscience entrepreneur and founder of Brain By Design. He passionately believes anyone can become who they imagine themselves to be at their very best. I love that. James spent his 20s doing psychology research at Columbia, Tufts and Yale, and his 30s building Think Unlimited, a nonprofit organization that created brain-based curriculum in partnership with the Queen of Jordan. I don’t think a lot of people can say that! Through his platform Brain By Design, he now builds e-learning courses about how to maximize your brain’s potential, a rare combination of scientist, trainer and entrepreneur. His previous work in the Middle East was featured by New York Times, Fast Company and TedX. I had the pleasure of meeting James when we were both speakers at a conference recently, and I enjoyed our in-between conversations. He was in the audience for my presentation. I was in the audience for his presentation, and I feel like we’re kindred spirits in that we geek out on the same kind of stuff. We’re reading the same authors, talk about very similar theories. I love what he’s talking about and I like his style, so James, I’m so glad that you’ve agreed to come on the TalentGrow Show to share some of that with our listeners. James: Thank you Halelly. So glad to be here. Halelly: I’m really glad that you’re here as well. Before we get started, I always ask my guests to give us just a brief overview of their professional journey, although your bio does a pretty good job of that. Tell us, where did you start and how did you get to where you are today? James: I didn’t come from a home that had a lot of books, actually, growing up, interestingly. Frankly, growing up, I thought all that reading was was fiction. I didn’t really know the genre of nonfiction even existed. You can kind of see the starting place, but a very suburban, vanilla upbringing. I had a grandmother that was sort of a self-taught intellectual. She didn’t go to college, but she was this kind of veracious reader. I ended up with some influences in my life that helped me down this road, but I was hungry, fast-forwarding, for more and did find nonfiction. Fell in love with reading, fell in love with psychology when I was at University and dove into research and thought I was going to become a scientist. Did tons and tons of research, more than I probably should have. I’m sure my social life suffered because of it. Sort of the end of my journey thinking I was going to become a scientist, what I kind of realized is that science is incredibly powerful, but that the way we’ve designed academic knowledge that grows up is that it’s really designed for other academics. It’s really designed for other scientists to digest. That sort of bugged me, that there wasn’t a way for the science to actually make difference in people’s lives. This is slowly changing, with movements like the positive psychology movement and others, but it was something I kind of realized was a need, to be this sort of bridge between academia and the rest of the world. The rest of our lives. Being sort of an idealist at heart, I suppose, I’ve spent the last 10 or 15 years trying to actually take the science out of the labs and get it into people’s lives. That’s taken a number of different forms. The first big one was Think Unlimited, that you mentioned, and now Brain By Design. Halelly: I’m so curious to hear about how you ended up connecting with the Queen of Jordan. That’s just a little bit unusual! James: It is unusual, right? The short story is my wife and I joined Peace Corps that sent us to Jordan. That’s how we got there in the first place. We started working on a very grassroots level in schools and youth centers there. Spent a lot of time just literally living in their little city called Salt and just got to understand the culture and some of the challenges in the education system, that sort of thing. We were in the middle of the Arab spring, in 2011. And at that point, we’d actually spent most of our Peace Corp service building out a program that was designed to kind of bring learning to life for kids. Again, sort of memorization is really what kids get in Jordan, in public school systems. Not to say we don’t get that here as well – we certainly do. It’s really a problem all over the world, that our education systems were built for a different era, around the Industrial Revolution, but that early start to the way we set up education systems 100-plus years ago, those starts have massive influence over time. The way we begin something has undo influence over time, and so the systems get very rigid. We saw these kids who were bright, motivated, optimistic, but very much part of a system that didn’t bring education and their sort of creative capacities, didn’t allow those to flourish. It really dampened them and sort of around the world, the U.S. and everywhere else, the skills of the 21st Century are around things like cognitive flexibility and divergent thinking and creativity and conceptual thinking. It’s no longer about memorizing. Memorizing, it’s not really what we’re trying to train kids to do around the world, if we’re trying to raise innovators and creators and entrepreneurs. So we built a program that sort of took on a life of its own. We fully expected to come back after two years, but while we were Peace Corp volunteers, we fortuitously met the Queen of Jordan. Actually what happened is she showed up at one of our camps. We were co-putting on this camp and literally – these things are kind of secretive until they actually happen – but we didn’t know she would be there. Funny enough, we didn’t even shower that morning! My wife or I. And so here we are, sort of just coming to put on our camp and I’m unkempt, didn’t shave that day, etc. There’s all this security around the center that we’re doing it at, and all this buzz. Eventually we realize, “Oh, something is going on,” and the queen is coming. Great. So of course we don’t know when, but we’re just doing our thing and she literally just walked into our room. She sat there and observed what we were doing and we had a lovely five or 10-minute conversation with her. She really was intrigued by the program we’d built and then turned to one of the executive directors of one of her organizations that she sponsors and said, “I want you to partner with James and Shaylyn.” That’s what happened, essentially, and then we met her a few other times. Halelly: Cool. Sounds like serendipity. James: It kind of was. Halelly: Serendipity led you to the opportunity, and then your competence landed you the opportunity. I’m sure of that. So, very nice. You talked about skills of the 21st Century and needing to be more divergent and creative. That was one of the main topics you discussed in the presentation that I saw you give and I liked how you describe that the mind has two modes and that a lot of times, we are asking people to be more creative or that we ask ourselves, we expect ourselves, or we need to be more creative, but we’re going about it in the wrong way. You say that there’s sort of two modes, so we need to actually move ourselves into the creative mode and out of the other mode, which is the executive mode. I’d love for you to talk more about that. James: This is cutting edge neuroscience. This is one of the most kind of fascinating and talked about findings right now, which is that our brain goes into what psychologists call mind wandering mode, when you don’t require it to do anything at all. So, when you’re getting ready in the morning, taking a shower, when you’re doing the dishes or sort of routine tasks that don’t require that much concentration – driving, going for a walk in the park – your brain does a number of different functions in this mode. Basically the big distinction is your brain only has two modes of attention. One is executive mode and one is mind-wandering mode. I like to call it creative mode. Scott Barry Kaufman, a very well-known psychologist a U Penn, calls it imagination mode. What we didn’t realize is how productive and how powerful this state of mind actually is. We used to think of it as daydreaming. Halelly: Right, that’s what I was thinking. James: And you’ll notice it, I have a 5-year-old, and even this morning I noticed as she was eating breakfast, she just kind of went into her mind. We would say she’s spaced out. We have these very derogatory terms for it, actually. But I knew exactly what was happening, which is that her mind is basically going into reflection, focusing inward and going into mind wandering mode. We’re not spacing out. We’re tuning in. It’s not only not an unproductive mode, it’s a highly productive mode. What your brain is really trying to do is deep problem solve, in a totally different way than the way we usually problem solve in executive mode. Executive mode, on the other hand, is whenever you’re directing your attention at something, you’re focusing on writing an email, whenever you’re paying attention – paying attention to someone talking or reading something or whatever that is – that mode, it costs you something. It’s energy, mental energy. Even those words “pay attention” are an apt phrase because it’s a cognitively expensive activity. But we all think linearly and logically in that mode. Nothing wrong with that, it’s just one tool in our kind of cognitive toolbox, whereas we have this very different way of solving problems, which is creative mode, where the brain is much more flexible, much more playful in the way that it goes about solving problems. Think of it this way – your brain is like a Google data center of experiences, education, books you’ve read, podcasts you’ve listened to, conversations you’ve had, relationships in your life. A rich web of a life, literally knit into your brain through your brain’s incredible capacity to record or create memories of these things. As your brain does this, you’ve got this rich resource of potential solutions to the problems you face. What we don’t realize is your brain already loves solving problems. Your brain is basically a dot connector. It likes to put things together and solve things. It loves it. It’s a meaning maker. If you allow your brain to do what it does naturally, mainly solve these problems in very creative ways, if you give it space to do that, it simply will do that. The misunderstanding of mind wandering mode or creative mode is simply that a lot of it happens on an unconscious level and it feels very random, so we can sleep all night, wake up in the morning and we have this brilliant insight and we think that all that happened was that we had a good idea. What we don’t realize happened, for hours and maybe even days or weeks before that insight, is your mind literally has been wandering around that Google data center of ideas, experiences, an article you read in Inc. Magazine or a thousand different data points it can kind of use to solve the problem. Literally pulling those things off the shelf, looking at them, examining them, reflecting, will this help me solve the problem? And if it does, then it shoots that idea up into the conscious realm and we experience it as insight. If it doesn’t, it basically puts it back on the shelf and keeps looking. Again, a lot of psychologists call this deep problem solving as opposed to what we kind of usually do, which is try to solve it by staring at our computer, thinking of it as a sort of as the way we think of it logically. It’s not logical. In fact, interestingly, your brain in this mode is sort of biased toward unusual connections, even bizarre connections. It’s not that all those connections are brilliant. A lot of them are not. But every once and a while they are, and again, this is the sort of wellspring of creativity and innovation. Halelly: From a practical perspective, if we can concretize an action item or to-dos from this, what really do we want to do here? Do we just need to spend more time allowing for creativity or for creative mode? Do we need to specifically prescribe a time for that during a process? What do you think we need to learn from this? James: There’s sort of two dominant patterns, I think, in modern life. One is time pressure. We feel this intense, never-ending need to be productive with every single minute of our lives. Nothing wrong with the sort of feeling. We all feel it. It’s just simply that what we mean by that is every minute of our lives should be in executive mode. That’s sort of what that equates to. And what that leads to, the second thing, is really it activates a stress response in the body. So whenever you’re on, whenever you’re available, you’re just running a low-level activated sort of sympathetic response in the body, which is basically stress. Whenever that happens, you simply can’t get into mind wandering mode. A precondition for mind wandering mode is relaxation. You’ve got to be relaxed. You’ve got to feel at ease. If you’re going for a walk – we’ll get into activities in just a second of what you can actually do kick start mind wandering mode – but if you’re going for a walk, you’ve got to be able to leave the phone at the office. Having the phone on you sort of closes that window. It doesn’t allow your body and mind to relax enough to basically kick-start that mind wandering process. What do you do practically? There’s lots of different activities that you can do to get into mind wandering mode, but the basic idea here is you want to work in sprints and breaks. Sprint, break, sprint, break, sprint, break. As opposed to designing your workday like a marathon, which is what most of us do. An eight to 12 hour day is a marathon for your brain. Your brain can really only concentrate for about 90 minutes at a time. What you want to do instead of going, going, going, going, and by 3 p.m. you feel exhausted and depleted and you find yourself surfing You Tube or Facebook, what you want to do is actually go hard and you really focus and try to get into peak states of concentration while you are working for those 90 minutes to a max of maybe two hours. Then you want to get up from the computer and go for a walk. You basically want to distance yourself from the work you were just doing. I often will go for a walk and I’ll lay down in the grass outside of my office, just simply to be with my own thoughts and let my mind reflect on what I’ve just done. What I’m actually doing is flipping. The metaphor here is your brain never turns off. It’s like a light switch, but it doesn’t turn on and off. It actually turns side to side, so think of it as a light switch sideways. It flips from executive mode to creative mode when you do these types of activities. As it’s in this more creative, deep, problem-solving mode, it’s just solving the problem in a totally different way. So you’re basically accessing your deepest recesses of creativity and sort of flexible problem solving when you’re doing that. On the surface of it, when I’m laying on the grass, if I were a manager of me, I would look at that person on the grass and be like, “Wow, they’re not at their desk, working.” And we punish these things, right? But it’s very clear, every peak performer in the world just does this. The stories are endless. Jeff Weiner, the CEO of LinkedIn, built his day this way. He works for 90 minute blocks, 90 minutes to two hours, and then he takes a break for 30 minutes, reflects on the previous meeting, goes for a walk, takes a nap, whatever it is. But he calls it is most important productivity tool. Another way of saying that is what looks like a waste of time is actually deeply productive. Not just in the sense that it helps you solve problems but it also recharges that mental battery that you need to go back at it when you go back into executive mode and into concentration mode. Halelly: Love it. If you have a tendency to be stressed, like every high-stressed job and you have lots of things weighing on your mind, I certainly know that sometimes even when I physically disconnect from my desk or whatever, my computer, my mind is ruminating and kind of going over and over the stressors and the worries and the to-dos. Is that good problem solving, mind wandering? Because I’m somewhere else, going for a walk and ruminating? Or is there something I need to do to try and accelerate breaking away from that kind of thinking? James: There is a little bit of a distinction – this is a very fine distinction – between rumination and mind wandering. I think there’s more research that needs to be done on this. It can be unproductive if your mind is basically overactive. And again, this is about how relaxed or kind of wound up you are. Yes, would it help to do a five-minute meditation or even a breathing exercise to activate that calming system in your body? For sure. And then go for the walk? For sure. Or even doing a couple of yoga poses, if you’ve got an office door and can shut it. I’ll do this all the time, move your body in any way that just kind of creates a state shift that kind of breaks the mental agitation, and again, moving your body is one of the best ways. Yoga, even just walking or running in place. Anything that just shifts the physiology, the neurochemical stew that you’re swimming in, it can be enough to break that tendency of rumination. But I wouldn’t worry about that too much. That’s sort of a higher-level application of this skill. Halelly: I’m worried about worrying, right? So Halelly. James: I think the real key is to step away from the desk. That’s the hard thing. To give yourself permission to take that five-minute break, and that’s usually what I recommend. You’ll get more comfortable with it over time and take longer breaks over time, but start with five minutes. Every hour, on the top of the hour, just step away from the computer and go for a walk outside. That’s the easiest way to just start getting into the habit of accessing that deeper, more powerful, not necessarily more power, but that completely often unused part of our brain. Halelly: There you go. To maximize the utility value from your brain, to actually get all the juicy bits from it. James: That’s exactly what it is. Halelly: Very cool. James, we could talk about this for hours and hours. I have created an artificial constraint of 30-minute podcasts, which I lament often. So, we’re going to start wrapping up here. I want to have you share with us something. I know sometimes it’s hard to motivate ourselves to do something that’s very hard to do. And as leaders, we sometimes also have to think about how to motivate others. Any great advice or tips or hacks that you can share about that? James: The biggest one is to shrink the size of whatever you’re doing. So, if you’re overwhelmed by an inbox that has 100-plus inbox, great. Set your timer on your phone for 10 minutes and clear out as many as you can do in 10 minutes and then sign out of your email and go onto something else. Then it becomes more of a game. You’re actually in this sort of challenge – you’ve got 10 minutes, how much can you get done? As opposed to that ick feeling we feel that we avoid and procrastinate. I would shrink it. The other thing I would say, B.J. Fogg, professor at Stanford, has this beautiful idea of what he calls motivation waves. Whenever you are in a particularly productive state, ride that wave! So get as much done as you can in that state. The Power of Full Engagement by James Loehr and Tony Schwartz, they talk about this as managing energy instead of time. It’s sort of a broad sense, this whole conversation has been about that. You’re learning to listen to your body more to you are things outside of your body. And then harness that motivation when you have it. Another way of saying this is follow your flow. I have that, actually, sitting in my office. Follow your flow because that’s where the creative juice and energy comes from and if you’re fighting against it, it can be tricky. Halelly: Of course I often put on my devil’s advocate hat, and it’s popping up here for me – a lot of people are saying, “Then I have to go to a meeting that I’m scheduled for and I can’t exactly do what I want to do or what makes sense for me energetically.” That can be a big challenge I know in today’s world of work, where you’re not always the king or queen of your own time. But there are still plenty of times when you can. James: Well, I would say your best energy is going to usually be for almost all of us in the morning. I’m in the habit of not checking my email first thing. I do all the hardest things in the morning. All the generative work that’s not, so I don’t check my email or social media in the mornings. I do that in the afternoons when I’ve got less charge in my mental battery. In the morning, that’s when I can do the hard stuff. That’s when I’ve really got that good juice. I also say the same with meetings – if I’m going to do meetings, you can design it so that it’s sort of the activities that you want your best energy for you want to do in the mornings, and the ones that are a little bit more you’ve got to get it done like clearing out an inbox, you might want to do in the afternoon. Halelly: Listeners, you might remember when I had Daniel Pink on, his latest book is When, and I know James you’re fan of that too. He talked about this as well. I think that was episode 83, if memory serves me correctly. Go check that out to get even more about that. Very cool. Before you share one specific actionable tip, James, with our listeners, what’s new and exciting on your horizon? What project or discovery has your attention these days? James: I would say the entire field of brain tech, or neuro tech, different words for it. I’ll be going to a conference in the beginning of November called the TransTech - Transformational Technology conference, in Palo Alto. It’s an emerging field. I think it’s a blue ocean. Something that doesn’t really exist, as far as mass adoption. There are early companies that started of course with apps like Headspace and Happify and earlier than that it was Luminosity. But it’s moving into wearables. Halelly: Like Muse, that measures how well you’re meditating? James: Muse is a great example. It helps you meditate by giving you neuro feedback by reading your EEG, your brain waves. Halo Neuroscience is doing sort of trans-cranial magnetic stimulation to basically increase how fast you learn. Vital Neuro, who is a startup that I’ve been involved with a little bit, they’ve designed tech to neutralize stress in the workplace, but it’s a headset that has … again, the best tech we have out there for reading your brain is EEG. And basically that reads brain waves or electrical activity from the brain. Anyway, there’s a whole host of different things, but I really think this is a game-changer. It’s going to take human potential really to a whole new level, because take creativity. We actually know how creativity works, and when you dampen areas of the brain that are kind of overactive and kind of bully the creative parts of our brain – that’s one way to think of it – you can quiet those parts of the brain. Things like meditation do that, for example. Then the creativity naturally emerges, so if tech can sort of nudge our better selves in those directions, then that’s exciting. Halelly: Very cool. You made me think of a person I need to connect you with who has a company that’s designing a wearable called Apollo. Have you heard of that? Working with people – his name is Dave Rabin based in Pittsburgh, and the main audience they’re working with right now for this wearable is people with PTSD and it’s like a watch and it sends different energy waves, like different vibrations, that actually can create more calm or can help you reduce anxiety and move and shift states. It’s so cool. James: I think I have seen this, yeah. Sure, that’s right. It uses the principles of entrainment, probably, which syncs up your body’s internal kind of rhythms. Your heart rhythm and your brainwave rhythm to then pull those into a calmer state. A lot of what we’re trying to do in general is about calming our brains and bodies down. The bigger picture is getting us out of a stress state, a high beta state, and into kind of an alpha state which is calmer and where our brains have better ability to focus, better ability to be creative and better. We just operate better in those. Halelly: I don’t think we were designed for this chronic stress mode we have in our modern world. Halelly: Well, awesome. And so thank you for that, that sounds exciting. I would like to hear about it after and maybe your biggest takeaways or insights there. What’s an actionable tip that you have, something that listeners can do today, tomorrow, this week, to ratchet up their own productivity or creativity or leadership, whatever tack you want to take on it. James: I already mentioned my primary tip, which is five-minute breaks maybe at the top of the hour or whenever works. The other one I would say, this comes straight from Dan Pink’s book When, is the 20-minute nap in the afternoon. You want to take a 20-minute nap. You don’t want to do it after 3 p.m. You won’t sleep as well at night or you’ll have a harder time getting to sleep, but anytime before 3 p.m. and probably after 1 p.m., go for the 20-minute nap. Find a way – this is hard in modern workplaces – but again, the most innovative companies like Google, Uber, Nike, Ben and Jerry’s, Zappos, Facebook, Huffington Post, they’ve all got nap pods now. It’s because the science is so clear. If you take a 20-minute nap – 27 to be accurate because it takes seven to fall asleep – then you’re just more productive. You’re more productive, you’re happier, more engaged, you have more emotional control, and that 20-minute nap boosted your creativity. The outcomes for that very small investment are just enormous, and instead of sort of slogging through our afternoons and masking our exhaustion with caffeine and sugar, which is what most of us do, you’ll actually get the same energized benefit as caffeine and sugar, but you’ll get all these other benefits as well, and you’ll vastly increase your productivity and creativity in the afternoons. Halelly: Which is definitely something that has made your ROI for all of us, so thank you for that tip. How can people learn more from you and about you and stay in touch James? James: My website is BrainByDesign.com. I’ve also got a Facebook page, you can like it. It’s just Facebook.com/BrainByDesign. If you’re interested in, and I do the email courses if you’re interested, I’ve got those and you can check them out. You can actually preview those, the first session of those, online. If you’re interested in sort of a summary, like a PDF, a free PDF of kind of the nuts and bolts of what we’ve talked about today, you can text the word BRAIN to the number 44144. That will spit out a PDF to your inbox. Halelly: Awesome. I love that you did that! Thank you for sharing that. Thank you for sharing your insights with the TalentGrowers today. I loved talking to you and love for you to stay in touch and hear more from you in the future. James: Likewise, Halelly. Thanks so much for having me. Halelly: Absolutely my pleasure. I love his energy and I love his insights and so I hope that you enjoyed this episode, TalentGrowers. I’d love to hear what is your biggest takeaway? What did you try and how did it go or what’s a question you have or what’s a “yeah, but” where you want to put on that devil’s advocate hat? What’s still bugging your or what seems like a confounding element about this? Let’s get a conversation going. I’m always super interested in hearing from you. You can email me or you can put it in the comments on the show notes page, over on my website TalentGrow.com, on social media or wherever you’d like to reach me. Even using that little voicemail tab on TalentGrow.com, you can record me a short voicemail. Aside from that, I hope you got lots of value and that you’ll put it to good use. Because action is the only way that any change happens. I’m Halelly Azulay, your leadership development strategist here at TalentGrow and until the next time, make today great.